KDDI Chairman Takashi Tanaka and President Makoto Takahashi with the students of the first MPT graduating class. TOKYO, Jul 5, 2018 - (ACN Newswire) - KDDI CORPORATION is implementing telecoms business operations in Myanmar, together with Sumitomo Corporation and Myanmar Posts and Telecommunications (MPT). As smartphones come into widespread use in Myanmar, demand for social networking services (SNS), video sharing services and content use is increasing. MPT has been offering LTE+ high-speed data transmission services since May 2017, and began offering a reward program in May 2018 as part of ongoing service upgrades. MPT employees who pass into the training program have been carefully selected. After 200 applications are received from MPT candidates, a written test and interviews with directors are administered within MPT to select four candidates - two from business departments and two from technical departments - with corporate leadership potential. Based on MPT's needs and recommendations, KDDI will administer its own originally designed training program. The program is scheduled to accept four new trainees for a second course of study to begin this fall. The program consists of Joint training: Academic studies including an overview of KDDI's business activities, business skills, Japanese language fundamentals; Business training: Practical training and applied study in detail, including visits to each of KDDI's business departments; and Technical training: Training in the complete cycle of planning, design, construction, testing and operation in line with a theme chosen by the trainee. As a company that always strives to offer exciting new ideas, KDDI will continue to work together with Sumitomo and MPT to increase customer satisfaction in Myanmar by promoting the integration of telecommunications and life design. 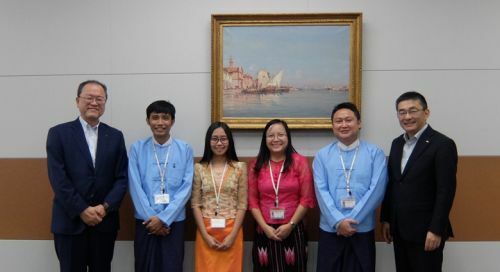 It is our way of contributing to the development of Myanmar's economy and industry, and improvement of the lives of the people of Myanmar by creating new experience value.